This "Cat Hat" was design for fun. For wearing it while skiing on the slopes. Perhaps even for the next Halloween. However, it could symbolize disrespectful, derogatory and sexual treatment of women too. Many of my friends will be going to Washington, DC for the Women's March. They will be giving a message to our leaders about women's rights for a decent life. 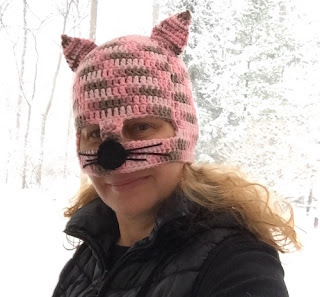 I will not be going to D.C., but my way to sympathize with their action and support their voice is to dedicate this "Cat Hat" pattern to them. I wrote this pattern after I finished the hat (I was too busy taking images), so if anyone of you will find any error in the written pattern. Let me know. I keep super busy with other projects (including my art and my art exhibitions) so your help of checking for my errors would be greatly appreciated. See video link below. Click on the images to see a little bigger image. Measurements flat: width 11", length (top to bottom) 9"
Hat reaches slightly over the tip of the nose, and below the occipital bone. 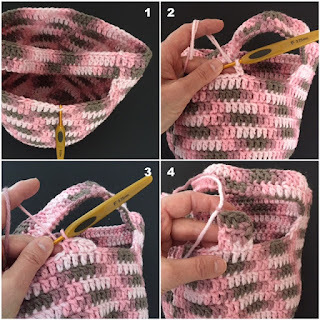 Note: If you want a medium/large size hat you could crochet 10 sc sts in the first row instead of 9 sc sts, and for large even 11 sts in the first row, and then do same repeats in Rnds 2 through 14th. Of course you would have different count of stitches in each row than in the pattern below. Also, you would have to adjust the "opening for eyes" in the Rnds 15 through 18. Rnd 15 ch3 (counts as dc), 1 dc in next 49 consecutive sts, turn, (total 50 sts) Note: there are 20 sts untouched (the part above your eyes - the eye opening). Later on we will crochet a "divide" in the middle = over the nose, between the eyes. Weave in all the tails/ends. Turn your hat upside down and insert your hook into your 9th st (leaving 8 sts untouched). You will crochet half double crochets 3 rows back and forth. 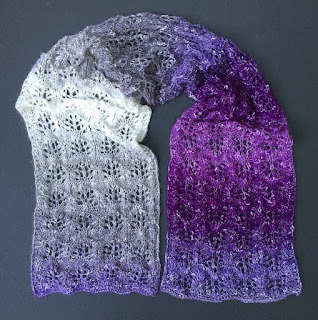 You can also opt for 2 rows of double crochets instead. When finished with your last row, leave a long enough tail to sew the divide to the "bottom part below the eyes". Count 12 sts from the corner to the middle and start sewing along next 4 sts (see images above for reference). When done weave in the tails/ends. Rnd 9 ch1, *[sc2tog, 1 sc into next 1 sts]* - 2x, join (4 sts) close the hole with a sl. 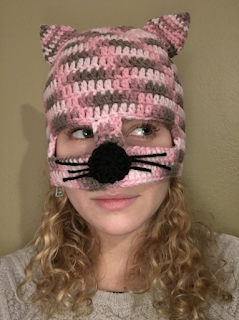 st. and pull the yarn tail to the inside and weave it in, then use the long tail to sew the ears onto the hat. 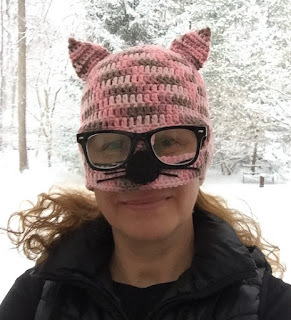 Me, wearing the "Cat Hat"